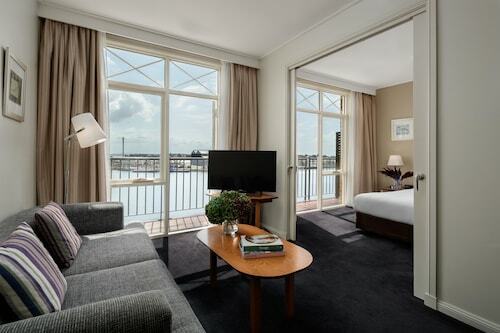 Situated on the waterfront, this luxury hotel is within 1 mi (2 km) of Newcastle Civic Park and Nobbys Head Beach. Newcastle Beach and Merewether Beach are also within 2 mi (3 km). Civic Station is only a 5-minute walk and Newcastle Interchange Station is 23 minutes. 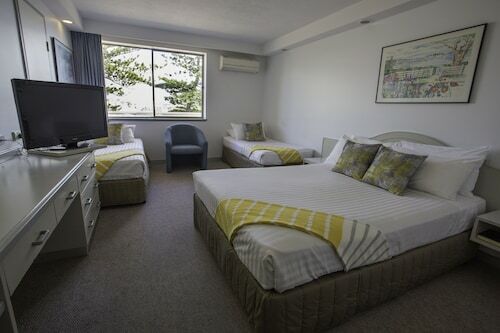 Situated near the beach, this luxury hotel is 0.6 mi (1 km) from Blackbutt Reserve and 2.9 mi (4.7 km) from University of Newcastle. Newcastle International Hockey Centre and Newcastle Showground are also within 2 mi (3 km). Broadmeadow Station is 25 minutes by foot. 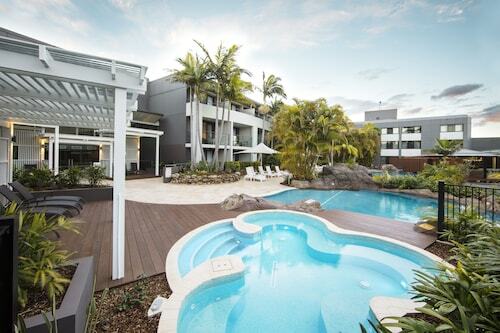 Situated by the ocean, this hotel is steps from Fort Scratchley and Newcastle Ocean Baths. Nobbys Head Beach and Christ Church Cathedral are also within 1 mi (2 km). Civic Station is 22 minutes by foot. Situated near the airport, this luxury hotel is 2.3 mi (3.7 km) from Newcastle Showground and 2.9 mi (4.7 km) from University of Newcastle. Newcastle International Hockey Centre is 2.6 mi (4.2 km) away. Waratah Station is 24 minutes by foot. 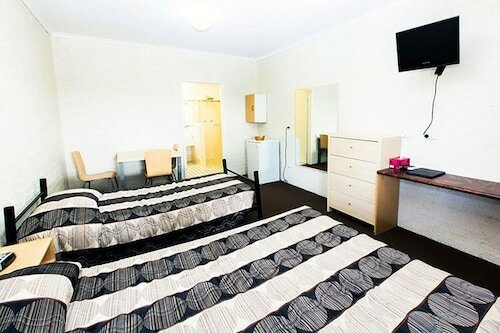 Situated in Cooks Hill, this hotel is within 1 mi (2 km) of Newcastle Civic Park and Merewether Beach. Newcastle Beach and Nobbys Head Beach are also within 2 mi (3 km). Civic Station is 9 minutes by foot and Newcastle Interchange Station is 21 minutes. Situated in Heatherbrae, this motel is 1.3 mi (2.1 km) from Hunter Region Botanic Gardens and within 9 mi (15 km) of Hunter Wetlands Centre and Myall Lakes National Park. University of Newcastle and Blackbutt Reserve are also within 12 mi (20 km). Situated in Wickham, this hotel is 1 mi (1.6 km) from Newcastle Civic Park and within 3 mi (5 km) of Merewether Beach and Nobbys Head Beach. Newcastle Beach is 2.2 mi (3.5 km) away. Newcastle Interchange Station is 8 minutes by foot and Hamilton Station is 18 minutes. 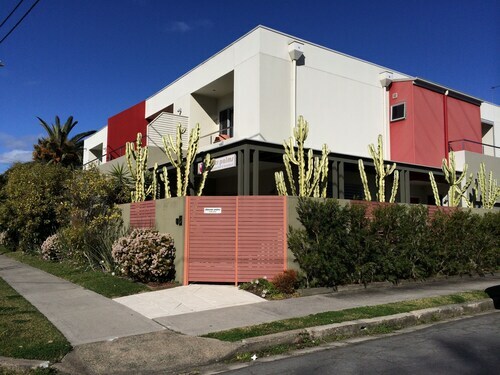 Situated in the entertainment district, this luxury bed & breakfast is 0.8 mi (1.3 km) from Newcastle Showground and within 3 mi (5 km) of Merewether Beach and Newcastle Beach. Nobbys Head Beach is 3 mi (4.8 km) away. Hamilton Station is 10 minutes by foot and Broadmeadow Station is 14 minutes. 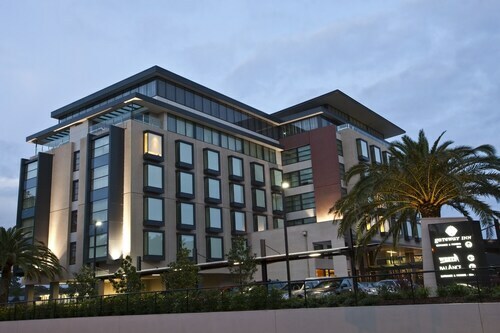 Located in the heart of Charlestown, this luxury hotel is 0.7 mi (1.1 km) from Charlestown Square and within 3 mi (5 km) of Westfield Kotara and Blackbutt Reserve. Glenrock State Conervation is 2.2 mi (3.5 km) away. 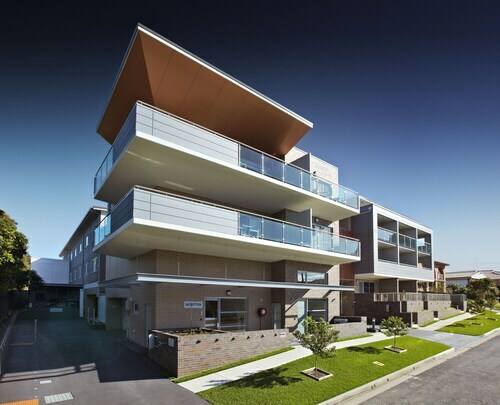 Situated in the business district, this romantic apartment building is 0.4 mi (0.6 km) from Charlestown Square and within 3 mi (5 km) of Westfield Kotara and Blackbutt Reserve. Dudley Beach and Glenrock State Conervation are also within 3 mi (5 km). The mouth of the Hunter River is chockablock with cool stuff. There are birds like straw-necked ibis and sharp-tailed sandpipers. There are fish swimming around doing fishy things. And then there’s the splendid city of Newcastle, a place where the sea meets civilisation in grand fashion. It’s also a great spot for your next holiday. Why? Well, it’s got heaps of neat things to do—like surfing, checking out wildlife parks and wandering through museums. Get things going by booking one of Wotif’s Newcastle hotels and leaving as soon as possible. How do I get to Newcastle from the airport? After your flight lands at Newcastle International Airport (NCL), 9km from the city centre, grab your bags and get going to your Newcastle accommodation. You can take a taxi, ride the metro or get a car hire. Simple as that. What are the most popular hotels in Newcastle? What kind of hotels are in Newcastle? If you thought the hotels in Newcastle were all the same, you’re surely mistaken. There are all sorts of cool places to hunker down at night, from luxurious resorts to backpacker hostels. Don’t believe us? Check out some of our offerings below. Novotel Newcastle Beach: Wake up in the morning and stretch your arms on your balcony overlooking the beach—yes, this place is practically in the sand. Then head down to the restaurant for a delicious breakfast (with mimosas, of course). After that, do whatever you want, because it’s your holiday, mate. Quest Newcastle Apartment Hotel: When you’re lounging around in one of these babies, you’ll feel like you never left home. This place has it all: valet parking, dry cleaning, an indoor spa and on-site restaurants. What more could you ask for? Backpackers by the Beach: Remember when you were travelling during your university and all you did was stay in hostels? You can go back to those days by booking a room here. Ahhh, the good old days. Where should I stay if I’m visiting Newcastle? What are some things to do in Newcastle? Blackbutt Reserve: When you’re ready to leave your accommodation in Newcastle and venture into the heart of Mother Nature, make your way to this stunning nature park. There are plenty of walking trails to stretch your legs on. During your hike, keep an eye out for the cuddly koalas that lounge in the tree tops. But above all, make sure you check out the flying fox colony that exists along the rainforest trail. The Bogey Hole: After you’ve worked up a sweat in the reserve, head to this swimming hole that was carved out of the rocks by convicts. What better way to rinse off the grime of the forest than by taking dip in an ocean pool? None. One for the Road Tours: This city has become a haven for craft beer and it’d be a sin not to enjoy the fruits of the brewer’s labour. Your friendly local guide will take you on a tour through brewski heaven, making stops at all the refreshing beer houses along the way. So there you have it. We’ve given you places to stay and things to do. 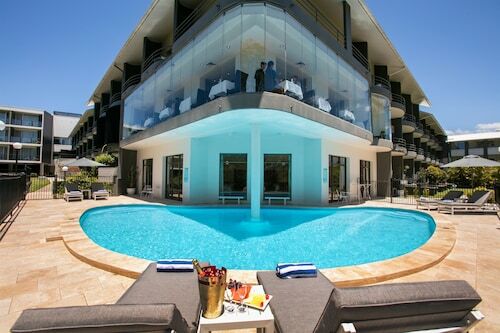 All you have to do now is check out Wotif’s Newcastle hotel deals and take advantage of one immediately. And when you’re ready for a stay along one of the most scenic highways in the world, check out our offers on Great Ocean Road accommodation. The term “a room with a view” is an understatement! Need insider tips on must-see attractions in Newcastle? Check out our Newcastle travel guide! How Much is a Hotel Room in Newcastle? 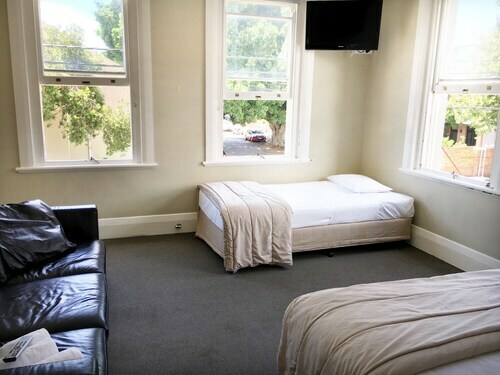 Hotels in Newcastle start at AU$95 per night. Prices and availability subject to change. Additional terms may apply. Spacious and modern . Can sleep 6. Great for a family or group.